Sonar systems use transducers to transmit an acoustic pulse of sound into the water. When the pulse of sound comes in contact with the seafloor, some of the sound reflects off the seafloor and returns to the ship as an “echo.” The time elapsed between the sound transmit and receive is used to calculate depth of the seafloor. A multibeam sonar system, like the one on the Okeanos, uses multiple transducers pointing at different angles on either side of a ship to create a swath of signals. In this animation, a survey ship uses a multibeam sonar to measure the depth of the seafloor. The warm colors (red, orange, yellow) correspond to shallower water depths, while cooler colors (green, blue, purple) indicate deeper depths. Video courtesy of NOAA. Download larger version (mp4, 8.6 MB). Hello readers and explorers alike! My name is Michael Smith and I am a graduate student at the Center for Coastal and Ocean Mapping at the University of New Hampshire. I am joined by my colleagues Larry Mayer and Kevin Jerram out in the Tongue of the Ocean here in the beautiful Bahamas. 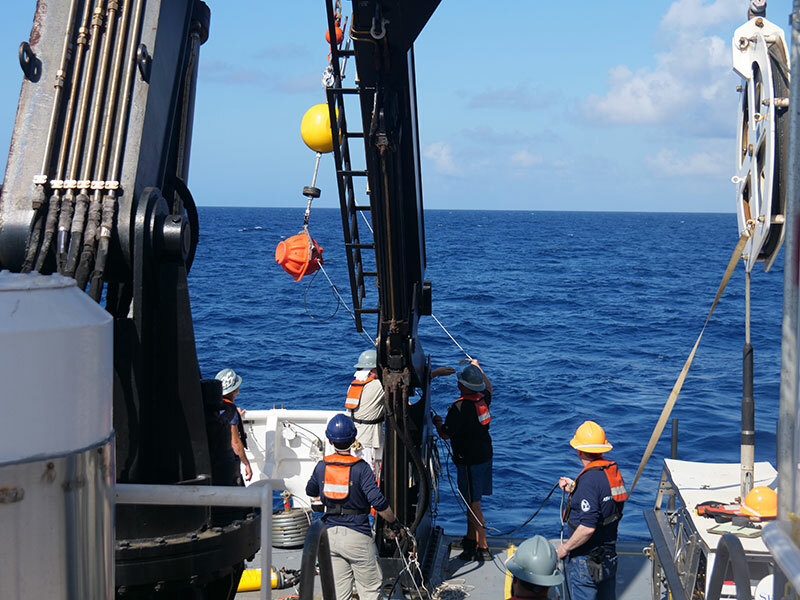 My team and I are out on NOAA Ship Okeanos Explorer to investigate the complex transmission characteristics of the multibeam echo sounder aboard the ship. The collection and production of high-resolution maps onboard the Okeanos is a crucial component of the exploration objectives of the ship. The maps produced by the ship illuminate never-before-seen features of the seafloor and are often the starting point for planning the fascinating sites the remotely operated vehicles dive on. The instrument we use to create these maps is a multibeam echo sounder. Deploying the hydrophones that will be used to listen for multibeam pings in order to better understand where the multibeam transmits its sound. Image courtesy of Levi Unema, GFOE. Download larger version (jpg, 8.7 MB). An acoustic device, multibeams (as they are commonly called) use sound to collect geophysical and oceanographic information such as the shape of the seafloor and the depths of plankton layers. The use of multibeam echo sounders to collect high-resolution datasets has greatly benefited the oceanographic community and expanded the application of these systems to a wide array of disciplines. As a scientific tool, multibeams have evolved extensively to meet the demands of modern research. The systems have grown in size and complexity, increasing the accuracy and resolution of the data collected. While these advances have greatly boosted the utility of these tools, there is a real need to account for the increased complexity of the systems. 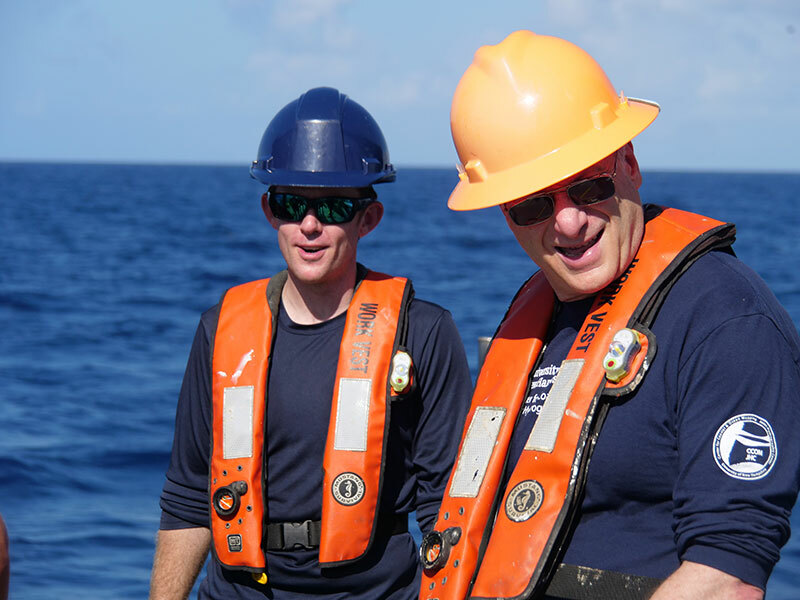 Robert Mills, JASCO, and Larry Mayer, University of New Hampshire - Center for Coastal and Ocean Mapping, work on deck to deploy the hydrophones. Image courtesy of Levi Unema, GFOE. Download larger version (jpg, 2.8 MB). Our interest is in quantifying exactly where the multibeam transmits its sound and the amplitude of the sound it sends in each direction. This helps us to better understand the acoustic echos, allowing us to further expand how we use the multibeam. In order to do this, we have deployed a specialized mooring designed by JASCO Applied Sciences. This mooring has hydrophones placed at various depths which are used to listen for multibeam pings. For the next few days, we will be running survey lines, pinging in various modes while the hydrophones listen.